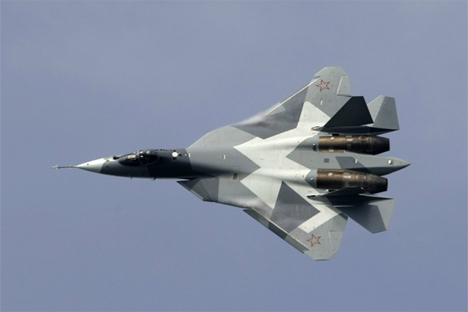 The fifth-generation fighter, the PAK FA, is currently undergoing state tests, while the PAK DA strategic bomber is not set to take its first flight for another four years. State tests of the new Russian fighter T-50 (the PAK FA project) have kicked off in Akhtubinsk in the Astrakhan Region, Air Force Commander Lt. Gen. Viktor Bondarev told journalists. According to the plan, the fifth-generation fighter will be used to send serial deliveries to troops beginning in 2016. The Air Force could even possibly receive the T-50 ahead of schedule. So far, only one country in the world is armed with a fifth-generation fighter — the United States (which has the F-22 and the F-35). "Air crews have been retrained and are now flying on one plane. Now a second plane is on its way and will fly under a testing program," Bondarev said, though he did not specify when exactly testing began. According to Bondarev, the T-50 was presented at the national round of Aviadarts 2014, the international competition for aviation excellence, in Voronezh. It will be shown during a special program prepared to mark the arrival of Defense Minister Sergei Shoigu. The Т-50 is a fifth-generation aircraft equipped with fundamentally new avionics and promising radar with a phased array antenna. It made its first flight in January of 2010 in Komsomolsk-on-Amur, and its first public demonstration was held at the MAKS aerospace pavilion in 2011 in Zhukovsky, just outside Moscow. In late April, it was reported that the PAK FA had received one of its most crucial elements – the Himalaya radio-electronic warfare station. The Russian Air Force is scheduled to be equipped with PAK DA high-tech strategic range bombers in 2023, Bondarev said. Russian news agency RIA Novosti quoted the Air Force commander as saying that the PAK DA will make its first flight in 2019. State tests will be completed and supplies will be delivered to troops in 2023. The PAK DA project was approved in March last year. This is a fundamentally new subsonic missile that is capable of using all existing and future weapons and which possesses low visibility. In the future, it will replace the current armed strategic bombers - the Tu-95 and Tu-160. It is assumed that the new PAK DA long-range aircraft will have a high level of combat power and be capable of overcoming modern air defenses. The machine will possess the latest complex of radio-electronic warfare capabilities and precision air weapons. It has also been reported that the PAK DA will be equipped with a hypersonic weapon. Last December, the long-range aviation commander of the Russian Air Force, Anatoly Zhikharev, said that the PAK DA would begin its trials in 2019 and enter army service starting in 2025. In late November of last year, United Aircraft Corporation chief Mikhail Pogosyan told President Vladimir Putin that full-scale work on the PAK DA would commence in 2014. Based on material published by RIA Novosti and ITAR-TASS.